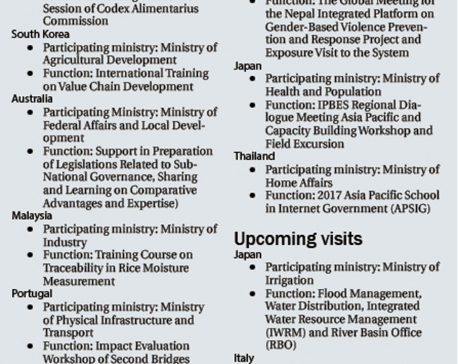 KATHMANDU, July 11: Government employees have spent over a billion rupees on foreign visits in the last two months. The bill includes over 1,400 trips of civil servants since May 18 this year. Some of the visits are scheduled to take place in the next few weeks. 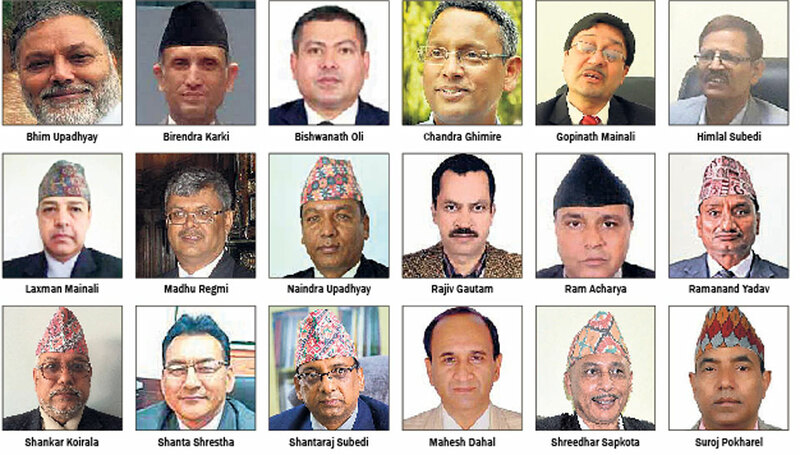 A total of 1,442 civil servants acquired permission from the government to visit over three dozen countries from May 16 to July 11, according to a document obtained by Republica. Most of the visits included field trips, exposure visits, study tours, familiarization and observation tours that sources said were of little gains. 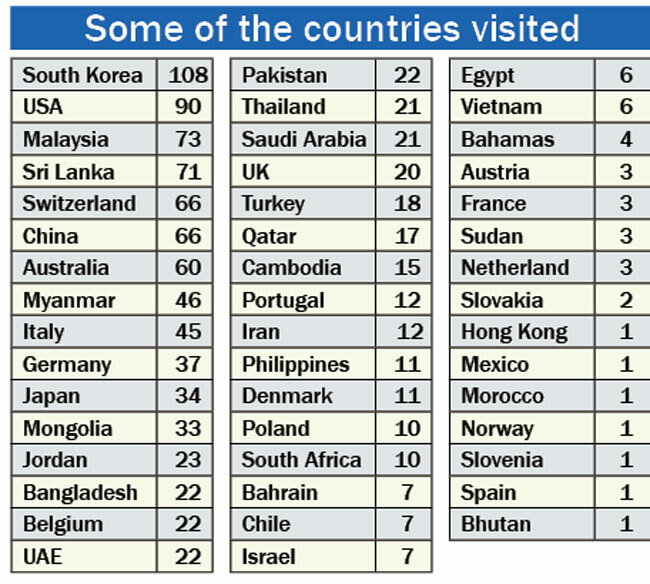 The exact figure of foreign visits could be much higher as it does not include visits made by civil servants to countries like India. In total, Nepali taxpayers had to foot over a billion rupees in travel bill including air tickets and travel allowances, according to preliminary estimate of government officials having knowledge about the cost. Some visits were sponsored by organizers. “Some visits were really useful to boost bilateral relations and for personal growth. But most of those visits were sheer waste of money,” said an official at the Office of Prime Minister. The revelation shows no decline in civil servants’ attraction toward foreign junket despite several restrictive measures taken by the government in recent months. In 2015, the government had introduced a policy to discourage such visits but had little impact. Officials said a host of factors including good travel allowances are major source of attraction toward foreign visits. Government officials get between USD 150 to 200 in travel and daily allowance depending on their designation. According to existing provision, government secretaries get USD 200 in allowance for day, while joint-secretaries and under-secretaries get USD 175 and USD 150 respectively. Government officials get even more lucrative allowance if the trip is sponsored by big donors and multilateral agencies. For instance, UNDP provides a minimum of USD 350 per day. “The government gives additional 33 percent on the existing amount in case of few countries that are considered expensive travel destinations,” said an official. Former General Administration Minister Lalbabu Pandit, who earned lots of praise for reforming bureaucracy with various measures, said the number of foreign junket is worrying. He said that the problem would worsen if the government does not show enough political willingness. Pandit said civil servants don’t want to miss any opportunity of foreign junket. “Most civil servants consider foreign junket as journey to heaven. Since there is a provision of providing expenditure to civil servants traveling abroad, they spend more time on how to arrange foreign junket than performing their assigned duties,” said former minister Pandit.